Spokane NAACP still has plenty to fight for. In the mid-1960s, when Alice Moore was about 30, she moved to Spokane with her then-husband and four young children and got a job at Kaiser, one of the few companies that had a good reputation for hiring black residents. After divorcing her husband, Moore says she moved around a few times, and despite her luck at work, she always found it a challenge to secure a place to rent, even in neighborhoods that were less than ideal. When she finally found the house she still lives in today, Moore says the landlord was willing to rent to her, but she could tell his wife didn't want to. "But Mr. Wilson, he didn't care," Moore says. "The neighborhood — I didn't realize this — I find out later, [a neighbor] said they went up and down the street saying I was going to be renting here, and did they want me here? And of course, no, they didn't, but it didn't work. Mr. Wilson rented the house to me." She knows some black residents still struggle to find rentals. Even now, Moore says, some will send a white friend to look at a listing first, but when it comes time to sign the lease and it turns out the potential tenant is black, some landlords will claim someone else already signed. Fighting racism and discrimination like that is one of the reasons Moore joined the Spokane chapter of the NAACP when she moved to town all those years ago, and why she hopes younger people will join the organization to keep the cause going. This year marks one century since members of Spokane's historically black churches gathered to form a local chapter of the National Association for the Advancement of Colored People (NAACP). With the chapter being officially recognized by April 1919, current organizers plan to celebrate the 100th birthday this month and throughout the year. Among the early leaders were Rev. Emmett B. Reed of Calvary Baptist Church, Rev. T.F. Jones of Bethel A.M.E. Church, and Frank A. Stokes, a businessman and member of Bethel A.M.E. who later became a longtime president of the chapter. 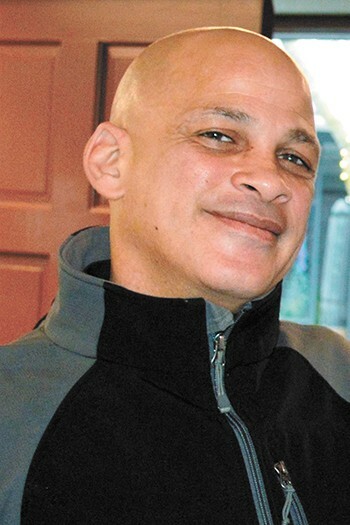 Over the years, the chapter's members would fight "against lynching and mob violence as well as discrimination and segregation in education, transportation, housing and voting," Dwayne Mack writes in his book, Black Spokane: The Civil Rights Struggle in the Inland Northwest. "Some blacks in Spokane joined the organization because they believed that the racial oppression they experienced in their city was minuscule compared to the problems that blacks faced in other parts of the nation," Mack writes. "As a result, members of the Spokane NAACP focused on assisting all black Americans struggling against racial injustice across the United States." But to be sure, there were still fights to be had in the Inland Northwest. Through the 1940s and later, the Spokane chapter called out segregation and unfair treatment of black soldiers nearby, and fought widespread discrimination as black people in Spokane were denied service at hotels, restaurants, stores, barbershops, salons, employment agencies and more, Mack writes. Some stores wouldn't cater to black customers at all, while others wouldn't let black customers try on clothing or shoes before purchasing them, for fear white customers wouldn't want to buy those items. Even celebrities were denied lodging and meal service, meaning the likes of Louis Armstrong, Cab Calloway and Duke Ellington had to be lodged by Spokane's black community when they came to perform, because hotels wouldn't have them, Mack writes. Housing discrimination was rampant, though sometimes hard to prove. Often, landlords and realtors would say other tenants or buyers had come in just before a potential black tenant, rather than admit they just didn't want to rent or sell to them. 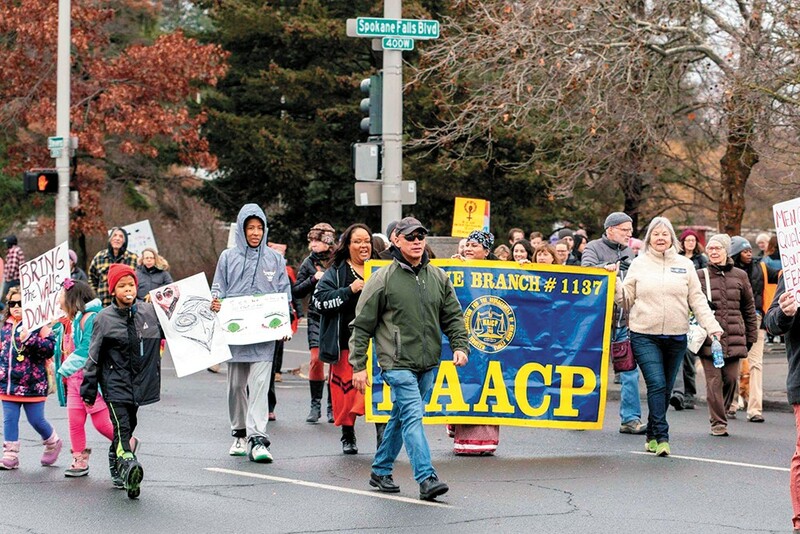 As the Spokane NAACP gets ready to celebrate its centennial, many of the issues members fought to address the last 100 years remain at the forefront of the group's work. Disparities in housing, education and the criminal justice system all remain problems. "If there's anything that really kind of stands out to me, it's that we're cycling back to some of the same issues we've been fighting the whole time," says Kurtis Robinson, current president of the Spokane chapter. Robinson joined the Spokane NAACP in 2016, and after becoming president in 2017, had a quick learning curve to take over a chapter that's had a tough time shaking the 2015 controversy surrounding former president Rachel Dolezal. Dolezal, now named Nkechi Amare Diallo, was respected by many members for her civil rights work, but in 2015, it was revealed that she'd lied about her background, and her story sparked international debate about the appropriateness of a white woman identifying and presenting herself as black. Understandably, there was something of a rift in the local chapter afterwards, with some supporting her and others distancing themselves from the group. "It was very hurtful, for our people and our organization," Robinson says. "When you're dealing with traumatized populations, that perception of disingenuousness can be very off-putting and very hurtful." But Robinson says that as with many harms that've been done to people of color, it's important to understand the issue, but also move forward. "You need to absolutely incorporate how you got there, the dynamics of the harm, but you don't want to pitch your tent there," he says. "You want to be able to have an in-depth understanding of how things occurred, but with plans to move forward." For Sandy Williams, a longtime civil rights activist and founder of the Black Lens newspaper, a similar tactic is necessary if Spokane is going to address other long-standing issues she's seen come up time and time again. She remembers working toward improvements in the education system when the chapter was led by V. Anne Smith, and says it's frustrating to see the same conversations still happening. Black students are disproportionately disciplined, suspended, expelled and arrested, Williams says. While efforts have been made to fix things time and time again, the systemic racism isn't going away, she says, suggesting maybe it's time to ask why that is. "Spokane is so invested in the perception that it's good and that it's not racist, you know, there's just so much investment in that, and people get so wounded at the concept that there's actually racism here," Williams says. "So it's like you're willing to do only so much, because if you go past this line, then you have to actually address the system. Anything up to that line means, 'We're really good people doing something,' but past that means the system is really screwed up and we need to do something about it, and we're not willing to go there." Robinson is hopeful that the Spokane NAACP is ready to come together with other community organizations to address those systemic issues in governmental bodies, the criminal justice system, the school system, and private industry. Restorative accountability is key, he says. The original print version of this article was headlined "Century of Civil Rights"